SafeBrands has developed a comprehensive service which enables you to monitor registration details for a domain name and/or a website. This service covers technical and administrative domain name changes, and changes to the content or structure of any website which can be accessed from a specific domain name. 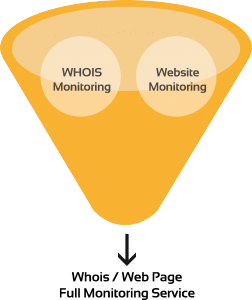 Our automated solutions use the exclusive technology developed by SafeBrands R&D, which monitors Whois changes as well as changes to web page content. Clear and usable results in alert reports either sent by e-mail, or accessed directly from your online account for full tracking of your files. Domain names are not static : they evolve over time. They may expire or be released onto the secondary market. They may be inactive, or attached to a website or e-mail service. The website may be in use and later disabled, or its content may change. These constant shifts may require targeted monitoring in order to stay informed of particular changes, especially in the case of domains that may infringe upon your trademarks. Monitoring a potentially contentious domain name / website. Receiving an alert if a domain name is being used. Acting in the event of infringing content being published. Acting as soon as a domain name is used to send e-mails (phishing). Tracking the domain name’s path through the convoluted secondary market (subsequent buyers, sales prices). Putting together a case prior to initiating recovery proceedings. Being informed of any change that may make a recovery action possible. We enable you to monitor all changes to a domain name’s Whois details. Specifically, you will be notified if the owner or one of the domain contacts changes, if the DNS servers are changed, and if the domain is renewed. Our monitoring reports show all changes, and provide a visual of the Whois details which have been changed (e.g. owner, date). Analysis of DNS fields such as MX records can identify if a mail service has been attached to the domain, enabling phishing to be detected in advance. Monitoring of the DNS fields attached to the domain name detects the publication of any new website and/or changes to hosting server IP addresses. Our system compares the page content to the copy taken from the previous week, and identifies any changes made to the website (content changes, potential defamation, sponsored links etc.). Real-time alerts and weekly summaries. E-mail notifications can be disabled if you prefer to access changes by connecting to your online platform. SafeBrands’ experts are responsible for defining the difference thresholds from which alert reports are generated. The groundbreaking algorithms developed by SafeBrands will ensure that you are only notified of significant changes. Our tool’s modularity enables us to work on the basis of the percentage of visual difference in the website and the percentage of technical difference (analysis of source code), thereby eliminating any false positives.